DOESNâ&#x20AC;&#x2122;T TRAINING WORK FOR YOU? Jared’s dynamic personality, coupled with ethic, have already translated into a business ily upon referrals, a true measure of excelle in the very competitive real estate industry. is about him that inspires such consumer con Jared pauses for a thoughtful moment before because I feel a connection to my clients,” h Phone 888-461-3930 | Fax 310-751-7068 when my wife and I bought our first home, how stressful it was. 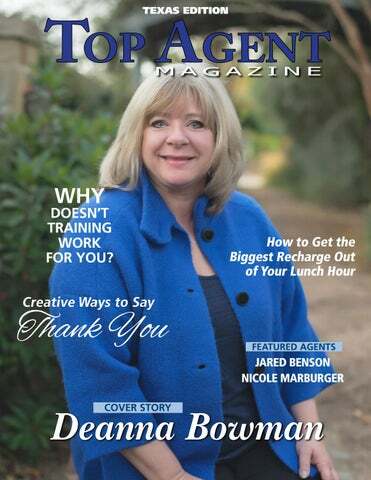 I really take those feelin mag@topagentmagazine.com | www.topagentmagazine.com I’m helping someone. I’m not just racing for t No portion of this issue may be reproduced in any manner whatsoever without prior consent of the publisher. 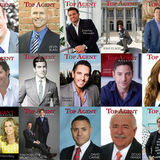 Top Agent closing table, rather I’m helping to educate th Magazine is published by Feature Publications GA, Inc. Although precautions are taken to ensure the accuracy of published cognizant of all the emotions that they’re goi www. materials, Top Agent Magazine cannot be held responsible for opinions expressed or facts supplied by its authors. To subscribe or change address, send inquiry to mag@topagentmagazine.com. Published in the U.S.
CHAD SNAPP TREC:21200 â&#x20AC;˘ ICC:8375691 (512) 578-6685 â&#x20AC;˘ chad@freeborninspections.com freeborninspections.com www.